Wireless Electric Vehicle Charging — Will it Work? It’s intended to take the hassle out of electric vehicle charging, and, according to its designers, Qualcomm, is a simple but effective alternative to cumbersome plug-in charging stations. Wireless Electric Vehicle Charging (WEVC) is designed to eliminate unsightly charging stations and unnecessary cables, and with just about everything else we use today incorporating wireless technology, it seems like the next logical step for the plight of the eco-friendly car. Here we look at how plausible the innovative idea is before it goes on trial in London in November. Wireless charging makes use of an electromagnetic field which transfers energy between two objects. The idea is that drivers will be able to park up at a charging station and have their vehicle recharged without even leaving their seat. Those who struggle to remember the basics of parallel parking from their driving lessons need not worry, as perfect pad and vehicle alignment won’t be necessary. The technology, named Qualcomm Halo, will incorporate smaller batteries than are currently used at charging stations, but Qualcomm explains that drivers will be able to charge their car little and often, with increasing convenience. As these spaces will remain reserved for electric vehicle owners, there will hopefully be an increase in those converting from fuel cars. The main vehicle test will be carried out using a specially adapted Delta Motorsport E4 Coupe. The Formula 1 car designer was required to add the pad to the vehicle in order to connect it to the road unit, as well as a touch screen interface to let the driver know when he or she is aligned with the charging pad. Throughout the trial, charging pads stationed at Qualcomm’s West London office and at minicab company Addison Lee, will be put into practice. The initiative, supported by Prime Minister David Cameron is designed to demonstrate how WEVC can work in busy cities, such as London. Time, or rather the lack of it, is everything in the city, so the option of quick, easy, and readily available charging is particularly appealing. With many making short but frequent trips, presumably the need for more charging pads will grow, as, hopefully, will the market for eco-friendly vehicles. 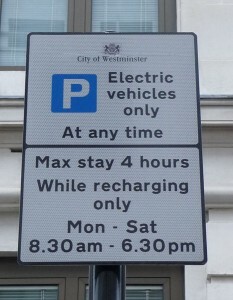 As an added incentive, drivers of electric cars can expect to avoid the daily cost of London’s congestion charge. In short, yes. Technology is ever advancing, and Qualcomm Halo not only recognizes this, but also promotes the needed reduction of fuel emissions. It’s not, however, alone in its wireless charging quest, with a similar trial already underway in Germany. Concept vehicles have also emerged from both Rolls-Royce, Delphi, and Infiniti/Nissan that include wireless charging technology. Google, Hertz, and Plugless Power are also testing out wireless charging technology. And researchers in Tokyo have created an electric roadway demo that wirelessly charges EVs. Although wireless charging is designed, first and foremost, for city driving, it remains to be seen if it could ever work outside of the city. The fact that motorists may well require a car for both urban and rural driving, therefore, poses a problem. Eco-friendly driving constantly comes up against questions of how practical it is, and Qualcomm’s idea is no exception. Certainly, the short-term vision has a lot of promise, but the long-term success of WEVC remains to be seen. This guest post was written by an eco-friendly driver and blogger, Isabelle Guarella, on behalf of PassSmart.com. This entry was posted in Alternative Energy, Alternative fuels, Green Cars, Power Saving and tagged Electric vehicles, wireless charging, WIRELESS EV CHARGING by fenleynicol. Bookmark the permalink.